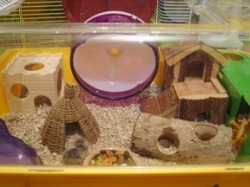 With dwarf hamsters, there are 2 categories of housing to think about: housing for a single dwarf and housing for a pair of dwarfs. Housing for a group of dwarfs tends to be on the same theme as that for a pair, only larger. When housing a single dwarf, you can more or less chose whichever cage takes your fancy, so long as it is suitable. When housing a pair or group, you have to be very careful as only a limited number of cages are suitable. You can read more about this below, in the "housing for pairs" section of the article. If you are chosing a cage for a Roborovski hamster, I would suggest one of the plastic cages as it is not unknown for a robo to be able to squeeze through the bars of a wire cage. Also note that for a Chinese hamster, I also recommend any cage from the Syrian section, especially the Imac Fantasy. Chinese are the only dwarf hamsters able to climb tubes. There are many cages suitable for a single dwarf hamster and far too many to cover here, so i shall give some examples of cages that I recommend. Avoid cages with vertical or steeply sloping tubes as, unlike Syrians, dwarf hamsters have furry feet and cannot climb steep tubes. I have twice kept a single winter white in this cage and both have loved it. 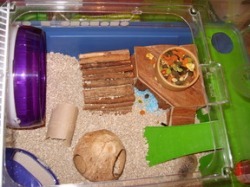 It measures 57cm x 31cm and comes with a second level, providing extra space for the hamsters. Here, I have replaced the wheel with a silent spinner and replaced the runged ladder with a wooden ramp. I'm not a fan of runged ladders (and nor are hamsters!). This cage can be picked up pretty cheap on ebay or in small pet shops. You can also add your own roof tubes or hammocks. This cage is widely available for very low prices on ebay. It used to be sold in Pets at Home, but has recently been discontinued. They are many things you can add to this cage, but personally i like to cut off the green plastic ramp and add a wooden bridge or play castle in the spot where the wheel would be. This allows access to the green level. I then add a silent spinner on a stand. Below you can see various set-ups. I have had many Rodys over the years and this cage is my top choice for a single dwarf based on ease of use, price and availability. This cage is also discontinued, but still turns up on ebay for around £5 - £15. It comes with a whole load of plastic paraphernalia inside, which I disguard. There's nothing wrong with the plastic bits; I just don't like them! However, I would at least throw away the metal springs and the runged wheel as I worry that a hamster could trap their legs in them. If you remove the plastic shelving, you will need to have some kind of bridge or platform that allows a dwarf to reach their drinking bottle, which fits onto the side of the cage (see photo below). There is also another rectangular hole on the opposite side of the cage, which fits some kind of feeder that comes with the cage if you buy it new. I cellotape a bit of card on the outside of the cage to cover this hole; i've never had a hamster pay much attention to this. Unless you have tall toys that a hamster could climb up (or you have a cat), there's no need to use the wire grill that comes with the cage. I love the removability of this grill, as i can then access my hamster with ease. The Peggy used to be sold in Pets at Home before being discontinued recently. However, these come up all the time on ebay for really low prices. I briefly used this cage for a Chinese hamster, towards the end of her life when she was no longer able to manage the tubes of her Imac Fantasy, and she seemed to like it. I also used this cage for a Syrian for a short time, but I found it to be too small for her and all her furniture and therefore bought her a Cambridge instead. 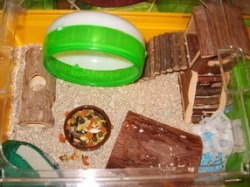 This cage can be found in Pets at Home and other pet shops as well as on ebay. It is very similar to the Lux and Rody, but includes a large plastic shelf, giving your hamster a lot of extra space. I only have one criticism of this cage and that is the hideous water bottle - the Ferplast Sippy. I have known many people say that their hamster cannot use this bottle, as mine couldn't. It is also very annoying to re-fill. I suggest replacing this bottle. This cage is a similar format to the Mini Duna, but has an additional shelf and tubes. Most cages with tubes are unsuitable for dwarfs (apart from Chinese) as they are too steep for these furry-footed hamsters to climb without sliding back down! However, the tubes of the Duna Fun have ridges inside to provide grip and are not too steep. Unfortunately, the Duna Fun is unsuitable for multiple dwarfs as they fight for territory over the tubes (I experienced this with 2 separate pairs). When choosing a cage to house multiple dwarfs there is much more to think about. Basically, there's a big long list of features that are not advised and there are only a few cages that don't include these things! The main aim with multiple dwarfs is to choose a cage that will give you your best chance of keeping them together. Dwarf hamsters can get very territorial and any features in a cage that give them something to fight over or claim as their own are a very bad idea. Such features include tubes, little hidey houses and anything with small compartments. The main thing to avoid is a modular cage, that is, a cage that has several sections linked together, such as rotastak, crittertrails, habitrail etc. Generally, you want to choose a flat, basic cage without tubes or compartments, like the ones shown below. These may seem boring, but they aren't boring to the hamster when filled with plenty of deep bedding, wheels and other appropriate toys. For more information about choosing toys suitable for multiple dwarfs, please see the toys section under Hamster Care. The Gabber Rex (sometimes known as Montagna Rex) measures 72cm x 43cm. This cage is now discontinued, but often turns up on ebay for prices as low as £5 - £10. This is my favourite cage for multiple dwarfs. It is ideal as there is a large open space with no ideas to fight over. you will need to have some kind of bridge or platform that allows a dwarf to reach their drinking bottle. I like to have a large bendy bridge, which also serves as the area to nest under. These bridges come in 3 sizes in Pets at Home and you need to select the middle size (currently £4.29) as the hamsters would fight over the space under the smaller one. As long as you don't have tall toys (or a cat), there's no need to use the roof bars with the cage. Personally, I remove the plastic shelf from the back. This is similar to the Gabber Rex, but is actually designed for guinea pigs, so the bars on the roof are quite wide apart and a hamster may be able to squeeze through. 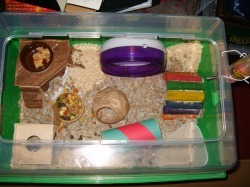 However, as long as you don't use tall toys (or have a cat) you can remove the bars because a dwarf hamster will not be able to reach the roof and escape. The Zoozone comes in two sizes, known as the Zoozone 1 and Zoozone 2. The Zoozone 1 is about 70cm x 45cm and the Zoozone is about 100cm x 45cm. The water bottle hole is a bit high for hamsters, so you can provide them with a bendy log bridge to step onto. The Zoozone is available from some independent pet shops, online stores and ebay.The Zoozone 1 usually retails at around £30 and the Zoozone 2 at around £40. Alternatively, both can be purchased from ebay for prices as low as £10. 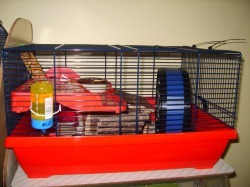 A cheap and spacious hamster cage can be created out of a plastic tub (or bin in the USA). These can be bought cheaply from many places such as Ikea or Staples. It can be difficult to find out large enough, but personally, i like the 84L Really Useful Box which measures around 70cm x 40cm. Many people, such as those who have cats, like to use the lid on their tub cage. If you wish to do this, you will need to drill plenty holes into the lid and high up around the sides of the cage (where the hamster can't reach them). Those who are good with tools could also cut out a section on the side of the tub and attach a metal grill.